Pursuing endless waste-producing economic growth and preserving a habitable planet is not possible. Mindless exponential growth will mean endless recessions of increasing gravity when ecological limits are passed. Traditional political parties base their thinking on the illusion that the Earth’s resources are without limits, and that it is possible to continue eternal, exponential growth in economy, material consumption and ecological debts. Alas, the Earth is a planet; a closed system, and we are quickly approaching the limits, or have in some cases already passed them. The Earth has 13.4 billion hectares of biologically productive land and water available. This figure is gradually decreasing with more tarmac, urban sprawl, pollution and land and forest depletion. In 2005 there were 6,5 billion people sharing these productive hectares, giving 2.1 global hectares per person. We are now more than seven billion people, giving 1,9 hectares per person if we assume the optimistic view that we still do have 13.4 billion hectares available. Some hundred years ago many people believed the Earth was flat. Today, many people have transformed the “Earth-is-flat-thinking” to “the-Earth-is-endless-thinking”. We even hear from some of these people that it would be a sin not to consume all natural resources right away, since they are “gifts from God”. However, the Earth is limited, and so are its resources. Endless, consumption-driven, waste-producing, exponential material economic growth simply cannot provide sustainable and equitable lives for seven billion, not to speak about the nine billion people we are estimated to be 35 years from now. The current liberalized monetary economy underperforms for the majority of the world’s human population, and it creates more problems than it solves. holders now own half of all household wealth. Our consumer society is based on building up a tremendous and unmanageble ecological debt. When debts become unmanagable, what happens to the economy? Is increasingly frequent crises a symptom? The Chinese economy is often portrayed as a miracle. However, some analysts predict a coming ecological collapse, with grave consequences for the Chinese economy – and with implications for the rest of the world. The markets are volatile and unpredictable. We seem to go from one crisis to the next. At times it seems like reckless speculators rule the world’s major economies. If a system does not perform, we should not ask for more of it. We should replace it with something that works better. We need economics for a sustainable future. The International community through the UN tries to sketch a new path towards more sustainability in the new UN Sustainable Development Goals (UN-SDGs). In the present system, economic growth is the given priority for all nations. All demand a growing GDP and a steadily increasing throughput: the flow of matter and energy from the environment, through the economic subsystem (production and consumption) and back to the environment in the form of waste. This is called the “value-adding chain”. The question is: “how big is the economy’s metabolic flow relative to the natural cycles that regenerate the economy’s resource depletion and absorb its waste emissions? What is the optimum scale relative to the ecosystem? When the throughput passes the optimum, the growth becomes uneconomic, and more ills are accumulated than wealth. Uneconomic growth makes us poorer, not richer. Uneconomic growth is not necessary to fight poverty. On the contrary, it makes it harder to fight poverty (Jackson , p.xi). The human ecological footprint has more than doubled since 1966. In 2007, the most recent year for which data are available, humanity used the equivalent of 1.5 planets to support its activities. Even with modest UN projections for population growth, consumption and climate change, by 2030 humanity will need the capacity of two Earths to absorb carbon dioxide, waste and keep up with natural resource consumption (Global footprint network, 2010). Classical economic thinking is based on a reality that existed more than 200 years ago. In the days of Adam Smith, global trade was measured in millions, not trillions of dollars. The human population was slightly above 700 million, not 7 billion. There was plenty of land, untouched forests and plenty of unpolluted waters. Labour was cheap and energy was not a key factor in production. Today’s reality is very different. We have now reached the limits to growth, and in many cases passed them. Our present economical system is based on a perception of a world that no longer exists. Our traditional economical thinking is thus based on illusions. Adam Smith had many good points that might still be valid. But at least some of his teaching must be revised. Karl Marx does not help us much either. His world existed 150 years ago. “Climate change is the defining human development challenge of the 21st Century. Failure to respond to that challenge will stall and then reverse international efforts to reduce poverty. The poorest countries and most vulnerable citizens will suffer the earliest and most damaging setbacks, even though they have contributed least to the problem. Looking to the future, no country – however wealthy or powerful – will be immune to the impact of global warming. Climate change is not just a future scenario. Increased exposure to droughts, floods and storms is already destroying opportunity and reinforcing inequality. Meanwhile, there is now overwhelming scientific evidence that the world is moving towards the point at which irreversible ecological catastrophe becomes unavoidable. Business-as-usual climate change points in a clear direction: unprecedented reversal in human development in our lifetime, and acute risks for our children and their grandchildren. There is a window of opportunity for avoiding the most damaging climate change impacts, but that window is closing: the world has less than a decade to change course. Actions taken – or not taken – in the years ahead will have a profound bearing on the future course of human development. The world lacks neither the financial resources nor the technological capabilities to act. What is missing is a sense of urgency, human solidarity and collective interest” (UNDP – HDI 2007-8). Land-use conflicts, rising food prices (FAO, 2011), rising mineral and fuel prices indicate resource scarcity combined with a reduced capacity of the planet to absorb the environmental impacts of economic activity. We are running out of environmental sinks. Climate change indicates overburden of such a “sink”. Atmospheric concentrations of greenhouse gases have passed 450 ppm. Pre-industrial concentrations were at 275 ppm. According to most climate researchers the level should not exceed 400 ppm to avoid a rise in global average temperature of 2 centigrade. Others claim it should not exceed 350 ppm (350.org). Other environmental sinks that are overburdened are forests, with tropical deforestation reaching 12.5 million hectares per year, loss of biodiversity a thousand times faster than normal, collapse of many of the world’s fish stocks, increasing freshwater scarcity, eutrophication of many lakes and chemical pollution. An estimated 60% of the world’s ecosystem services have been degraded over the last 50 years. “Prosperity for the few founded on ecological destruction and persistent social injustice is no foundation for a civilized society…Prosperity consists of our ability to flourish as human beings – within the ecological limits of a finite planet” (Jackson, p.15). When discarding a system, we need a new to replace it. What do we want with this new system that the old is not giving us? What are the goals? Most people want prosperity. In other words, they want a sense of wellbeing and a sense of continuity, a feeling of security for tomorrow. The present system might give a sense of wellbeing for a few. The problem is that most of us have an uneasy feeling that we systematically erode the basis for tomorrow’s wellbeing. A main driving force is inequality. The rich are getting super-rich while middle and lower class incomes are stagnant or reduced. The perception of wealth is always relative. Perceived injustices can be corrected by the only reward monetarism can give: more money to enable you to buy the goods that the rich have. In order to reduce prices for these goods, monetarism promotes deregulation of markets and a constant stimulation of consumer demand. In monetarism or neo-liberalism thinking, natural resources and environmental sinks are regarded as free. If there is a cost connected to these, the trend is to externalize these costs: the general public or those living adjacent to production, transport and waste have to pay the costs. The system as a rule fails to protect the environment as long as the rich can protect themselves by moving elsewhere, while the less wealthy have to pick up the bill. The super-rich may increase their quality of life while the poor increase their quantity of unnecessary stuff in a futile quest for a feeling of “justice” – both at the expense of the environment and their own wellbeing. Prosperity must therefore be redefined. Ruthless greed can no longer be a basis for respect and admiration. Prosperity must provide the necessities of life. However, the rule of “diminishing marginal utility” entails that obtaining more of the same gives less satisfaction. The first piece of chocolate tastes very good. The 20th piece of chocolate gives less pleasure, and might even have a detrimental effect. In other words: subjective well-being diminishes at higher income levels, especially if the higher income erodes the basis for future security and well-being (Jackson, 2011, lecture). The crux is to find the balance between short-term subjective well-being and long-term security. Monetarism simply does not provide for this. 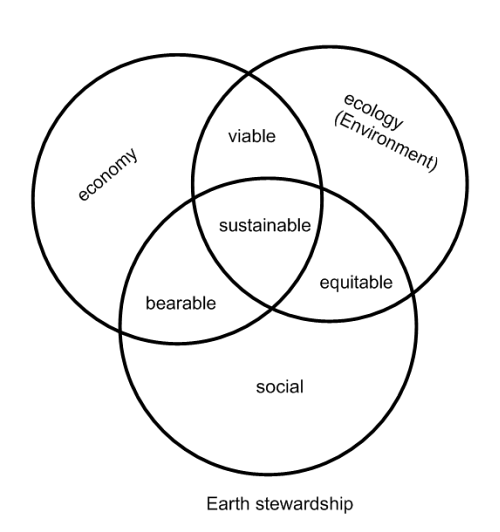 In the new eco-economic system, the question of finding the optimal balance is vital. Freedom is an important value, but must have its limits. Certain freedoms are immoral or unsustainable. Endless accumulation of material goods, unethical exploitation of other human beings and natural resources causing depletion of biodiversity or polluting the environment at the expense of others are examples. Ecological resources such as fossil fuels, freshwater, fish stocks, timber, land, minerals must be managed responsibly, not irresponsibly exploited by short-term greed. The regenerative capacity of the ecosystems: atmosphere, soils, diversity of species, forests, water and oceans must be preserved. Mangrove forests need protection. Eco-tourism in mangroves, Sri Lanka. If not, we deplete our natural capital and impoverish our planet. More stuff cannot compensate for a destroyed environment. In our new economy, extraction, production, transport and consumption cannot externalize environmental costs (Leonard, 2011). Eco-communities can not accept being dictated by multinational companies. The freedom such companies take to dismantle and move production facilities built by a local community, or require the freedom to externalize negative production costs and put them on the community, means that the freedom of the people in the community is jeopardized. This kind of unethical business practice is not acceptable. The freedom to procreate endlessly is problematic. The bigger the human population, the faster we deplete the ecological buffers and smash into the absolute limits to growth. Another two billion people will be added to global population over the next 25 years, the vast majority in poorer nations, which will add huge demands for energy and economic growth. If that growth is not achieved in an environmentally sustainable way, its effects on poverty and human well-being will be disastrous. It will be too late 25 years from now to make the right choices. For the sake of our children and our children’s children, we must act now (World Bank 2004). A smaller population means less pressure on our ecological resources. The current liberalized economic system needs growth in the population. A stagnant or reducing population means a stagnant or reducing economy – in other words crisis. The new eco-economy must give incentives for population control and thrive in a physically diminishing but otherwise flourishing population. Social well-being requires trust, security and a good community. “Relationships, meaningful employment and the ability to participate in the life of society appear to be important almost everywhere” (Jackson, p. 47). Neo-liberalism tries to make us believe that prosperity equals material wealth. Material wealth is vital because it provides a language with which we can communicate with others and participate in society. However, if participation is the crux, the richer societies should be able to give evidence of that. However, it seems that in many cases it is possible to register “rising rates of anxiety and clinical depression, increased alcoholism and binge drinking, and a decline in moral at work…breakdown of community, a loss of trust across society and rising political apathy” (Jackson, p. 144). The Sheffield loneliness index (SLI, 2009) indicates that the sense of loneliness in Europe is sharply increasing. It seems that those with high intrinsic values are happier and live more sustainably than those with materialistic values. There are several communities based on such intrinsic values. The Impact (I) of human activity is the product of three factors: Population size (P), Affluence level (A) or income per person with associated consumption behavior and technology (T). If the population rises, the impact can be reduced by a reduction in affluence or consumption, or by an improvement in technology in the sense that the technology increases efficiency. If technology efficiency improves fast enough to outrun the pace at which population (P) and consumption (A) rise, the impact level remains the same. If we need to reduce Impact, technology must become even more efficient, or must be combined with a population and / or consumption reduction. Since 1990, carbon intensity (improved technology) has declined by 0.7% per year. However, human population has increased by 1.3 % and per capita income by 1.4% over that period. Technological efficiency has thus compensated not even for the increased population. The impact is no doubt rising. The atmospheric carbon dioxide has increased by 40% since 1990, despite the aim of the Kyoto protocol of reducing the total emissions by 5% compared to 1990. To achieve the IPCC emission target for 2050, carbon intensity must be reduced by 9% every year for the next forty years. By 2050 the carbon intensity would need to be 55 times lower than today. There are advantages to our current system of constant innovation and creative destruction (Jackson, p.88). However, creative destruction implies that today’s gadget is replaced by a new gadget tomorrow. In many cases, the new gadget is more efficient, but most of them have a built-in obsolescence, meaning that after a fairly short time, it will cease to function or otherwise be obsolete. Our new product will be shinier but have a shorter lifetime. Quantity goes before quality. Things have an important symbolic role in consumerism. We use them to give signals about ourselves, who we are, our status in society. The ideal consumer is “an empty shell” (Jackson, p.100) with a continuous need of being filled up with food, products and celebrities”… “The extended self is motivated by the angst of the empty self. Social comparison is driven by the anxiety to be situated favorably in society. Creative destruction is haunted by the fear of being left behind”. This system is obviously very creative. The problem is that it is also very destructive. We increasingly see others as competitors. We tend to lock ourselves inside our small private castles of gadgets. There is less social cohesion. Our working places are constantly threatened. There is an increasing feeling of emptiness, insecurity and anxiety. Like Alice in Wonderland we have to run faster and faster to stay in the same place. Our ecosystems are increasingly depleted. We must “free ourselves from the relentless flow of novelty that drives material throughput and find instead a lasting prosperity – the potential to flourish, within ecological and social limits” (Jackson, p. 102). We have to keep creativity but somehow decouple material growth from our economical system. Demands for increased efficiency and profits require minimization of investment factors like capital, labor and material resources. Increased labor productivity is therefore a must in our current monetarist system. This means producing more with less people. Technological progress increase production and reduce prices. In other words, it stimulates growth in consumption and reduces job opportunities. This system is far too wasteful of natural resources and cannot continue. The option is “green economy”. UNEP defines a green economy as one that results in improved human well-being and social equity, while significantly reducing environmental risks and ecological scarcities. A green economy is low carbon, resource efficient and socially inclusive. Growth in income and employment should be driven by public and private investments that reduce carbon emissions and pollution, enhance energy and resource efficiency, and prevent the loss of biodiversity and ecosystem services. Green economy demands a change in investments. For example, price and production subsidies, permissive rules for externalization of costs and tax breaks for fossil fuels collectively exceed hundreds of billions of dollars every year (GSI, 2010), and this high level of subsidization can adversely affect transition to the use of renewable energies. In contrast, enabling conditions for a green economy can pave way for the success of public and private investment in greening the world’s economies, reduce other environmentally harmful subsidies; employ new market-based instruments; target public investments to “green“ key sectors; greening public procurement; and improving environmental rules and regulations as well as their enforcement. Green economy can reduce persistent poverty in agriculture, forestry, freshwater, fisheries and energy. Sustainable forestry and ecologically friendly farming methods help conserve soil fertility and water resources in general. Green economy removes environmentally harmful or perverse subsidies through appropriate regulatory framework and green public procurement, and through stimulating investment. Green economy maps ecological resources and puts prices on these commodities. “Ecosystem services”, such as biodiversity, contribute to human wellbeing and provide vital resources. So far these services have been economically invisible, resulting in mismanagement and loss. The ecosystem services are part of our natural capital, such as forests, soil, clean air, lakes, wetlands and rivers. The carbon cycle and its role in climate mitigation, soil fertility and its value to crop production, local microclimates for safe habitats, fisheries for proteins, are all crucial elements of a green economy. The economics of ecosystems and biodiversity (TEEB) puts price tags on ecosystem services. This can be an advantage to the environment – or be destructive in the sense that the value of the ecosystem service might be given a modest price tag while the profit of an enterprise is given a high value, even when the ecosystem service is paid for. If this system is not carefully thought through, it might facilitate landgrabbing by the richest multinational corporations, as less wealthy local enterprises might not be able to internalize ecosystem costs. The age of fossil fuels will soon end. We need to plan the transformation now. Green economy means transforming the energy sector away from fossil fuels over to renewable energy technologies. This may make a significant contribution to improving living standards and health in low-income areas, particularly in off-grid situations. Cost effective solutions include clean biomass and off-grid solar photovoltaics, with low operating costs and flexible, small-scale deployment options. “Solar grows more rapidly than any other renewable technology. Renewables become the world’s second-largest source of power generation by 2015 (roughly half that of coal) and, by 2035, they approach coal as the primary source of global electricity” (IEA (2012) Global Energy Outlook) | Bloomberg: renewables set to triple by 2030 . Green investments tend to be more employment intensive than “brown”. Eco-taxes, which raise the price of emissions and natural resource use while reducing the cost of labour have shown positive employment impacts. Improving energy efficiency in all transport modes and shifting from private transport to public or non-motorized transport would further increase employment by about 10% above business as usual. Investments in improved energy efficiency in buildings generate million of jobs. Employment in the renewable energy sector has become substantial with millions of people worldwide working directly or indirectly in the sector. Recycling employs several million people, while sorting and processing recyclables sustains 10 times more jobs than land filling or incineration on a per metric tonne basis. In green investment scenarios, projected growth in jobs in the waste sector rises by 10% compared to current trends. To be truly green jobs they also need to match the requirements of decent work, including such aspects as a living wage, the elimination of child labour, occupational health and safety, social protection, and freedom of association. The greening of the energy sector requires substituting investments in carbon-intensive energy sources with investments in clean energy as well as efficiency improvements. Despite the global recession, this sector is doing well. The growth is increasingly driven by non-OECD countries, whose share of global investment in renewables rose from 29% in 2007 to 40% in 2008, with Brazil, China, and India accounting for most of it. Renewable technologies are even more competitive when the societal costs of fossil fuel technologies are taken into account. The central challenge is to decouple growth absolutely from material and energy intensity. Redesigning production systems would involve the redesigning of products to extend their useful life by making them easy to repair, recondition, remanufacture and recycle, thereby providing the basis for closed cycle manufacturing. Recycling supports the use of byproducts of the production process while also providing alternatives for substitution of inputs in manufacturing. Recycling of materials such as aluminum, for instance, requires only 5% of the energy for primary production. – saving money while enhancing productivity and social inclusion. Promoting green cities raises efficiency and productivity. Eco-cities or green cities are typically characterized by higher density of population, housing, employment, commerce, and entertainment facilities. Well connected and designed neighborhoods allow for effective provision of public transport and are seen as a starting point for green cities. Doubling the employment density of an urban area – and respecting decent work conditions – typically raises labour productivity by around 6%. Infrastructure, including streets, railways, water and sewage systems as well as other utilities comes at a considerably lower cost per person the higher the urban density. 3) improving vehicle and fuel technology to reduce the negative social and environmental effects from each kilometer travelled. Policies required include land-use planning to promote compact or mass transit corridor-based cities, the regulation of fuel and vehicles, and the provision of information to aid decisions by consumers and industry. Strong economic incentives such as taxes, charges and subsidy reform can also support an increase in cleaner private vehicles as well as a shift to public and non-motorized transport. With more than half of the green investment scenario allocated to raising energy efficiency across sectors and expanding renewable energy, including second generation biofuels, global energy intensity would be reduced by about 40% by 2030. Together with the potential carbon sequestration of green agriculture, a green investment scenario is expected to reduce the concentration of emissions to 450 ppm by 2050. Policy options for transitioning to a green economy not only exist, they are being implemented by many countries. The governments that act early to establish green economy enabling conditions will not only support the transition but will also ensure they are in the best place to take advantage of it. A regulatory framework can regulate the most harmful forms of unsustainable behavior, either by creating minimum standards or prohibiting certain activities entirely. Many subsidies represent a significant economic and environmental cost to countries. Artificially lowering the price of goods through subsidization encourages inefficiency, waste and over use, leading to the premature scarcity of valuable finite resources or the degradation of renewable resources and ecosystems. For instance, global subsidies to fisheries have been estimated at US$ 27 billion annually, at least 60% of which have been identified as harmful, and are thought to be one of the key factors driving over-fishing. It is estimated that depleted fisheries result in lost economic benefit in the order of US$ 50 billion per year, more than half the value of global seafood trade. When subsidization makes unsustainable activity artificially cheap or low risk, it biases the market against investment in green alternatives. By artificially lowering the cost of using fossil fuels, such subsidies deter consumers and firms from adopting energy efficiency measures that would otherwise be cost effective in the absence of any subsidies. Banking, investment and insurance need significant changes in philosophy, culture, strategy and approach, in particular short-termism. This will be required if capital and finance is to be reallocated to accelerate the emergence of a green economy. Green investments will also enhance new sectors and technologies that will be the main sources of economic development and growth of the future: renewable energy technologies, resource and energy efficient buildings and equipment, low-carbon public transport systems, infrastructure for fuel efficient and clean energy vehicles, and waste management and recycling facilities. Complementary investments are required in human capital, including greening-related knowledge, management, and technical skills to ensure a smooth transition to a more sustainable development pathway. Green economy supports growth, income and jobs. The so-called “trade-off“ between economic progress and environmental sustainability is a myth, especially if one measures wealth inclusive of natural assets, and not just narrowly as produced output. In sectors whose capital is severely depleted, such as fisheries, greening will necessitate the loss of income and jobs in the short and medium term to replenish natural stocks, but this is to prevent the permanent loss of income and jobs in these same sectors. In such cases, transitional arrangements are needed to protect workers from negative impacts on their livelihoods. In summary, a green economy values and invests in natural capital. Ecosystem services are better conserved, leading to improved safety nets and household incomes for poor rural communities. Ecologically friendly farming methods improve yields significantly for subsistence farmers. And improvements in freshwater access and sanitation, and innovations for non-grid energy (solar electricity, biomass stoves, etc) add to the suite of green economy strategies, which can help alleviate poverty. A green economy substitutes clean energy and low carbon technologies for fossil fuels, addressing climate change but also creating decent jobs and reducing import dependencies. New technologies promoting energy and resource efficiency provide growth opportunity in new directions, offsetting “brown economy“ job losses. Resource efficiency becomes a driving proposition – both energy and materials use – be it in better waste management, more public transportation, green buildings or less waste along the food chain. Taxes and other market-based instruments can be used to stimulate the necessary investment and innovation for funding the transition. Pigovian taxes are no new ideas, but could be implemented in a much larger and stricter scale. And while the scale of financing required for a green economy transition is large, it can be mobilized by smart public policy and innovative financing mechanisms. The neo-liberal economy claims that economic stability can only be achieved through economic growth. The repeated financial crises clearly demonstrate that this kind of “stability” is extremely fragile. Our new eco-economy instead emphasizes resilience. The economy must be able to resist exogenous shocks, provide security for people’s livelihoods, ensure distributional equity, impose sustainable levels of resources throughput and protect natural capital (Jackson, p.141). A key element in building community resilience must be to reduce social inequality. Unproductive status competition increases material throughput and creates distress. According to the research group “Resolve” (Resolve 2011), liberalized market economies tend to have higher per capita carbon emissions, higher infant mortality, higher teenage pregnancies and more people saying they feel like an outsider. The task of a sustainable economy is to provide capabilities for flourishing within ecological limits. This can happen when the changes in the economic system support social behaviors and reduce the structural incentives to unproductive status competition. A more equal society is less stressful, reduces loneliness and family breakdown, reduces the individualistic pursuit of novelty, accumulation of stuff and debt, increases savings and economic prudence and supports prosperity in the form of flourishing (Jackson, p. 156). A sustainable economy builds local resilience and more robust societies. A globalised market based on the values of the neo-liberal economy transfers political and economic power to big multinational companies and to speculators. The local interests based on making sustainable livelihoods and resilient communities must therefore systematically and deliberately decide the terms of conducting business in the eco-economy. In cost-benefit analyses, factors like social and environmental capital must be included. Questions must be asked whether costs are externalized or internalized. Rather than a myopic look at a limited price-tag, priorities should be given to increase social cohesion, build local competence and capacity, protect and enhance local environmental and social capital. If the challenge for example is to secure energy for keeping houses warm, priority should be given to local solutions. The price tag by itself might indicate that drilling deep holes for geothermal energy is higher than procuring electricity through cables from a far-away place. But energy from somewhere far away increases local vulnerability, and gives the profit to far-away people. The cheap price tag has most likely unethically externalized costs, such as increased depletion of the environment. When calculating in the benefits of increased local cohesion, increased local capacity and competence – in other words increased local social as well as financial capital – in addition to a much more resilient local community and a better off environment, the real price difference might shift. Establish limits. Natural resources must be identified and environmental limits given. There must be caps on emissions of waste as well. All companies must internalize until now externalized negative costs. This can be done through taxes on “ecological bads” like emission of carbon, while taxes on e.g. labor are minimized or removed. Investments must be in renewable energy, energy efficiency, resources efficiency, low-carbon infrastructures and carbon sinks like forests (Jackson p. 175). Financial markets must be regulated: unscrupulous practices must be outlawed. Excessive remuneration must be reduced, and incentives for domestic saving provided. A Tobin tax on international currency transfer to reduce excessive and completely unproductive speculation must be implemented. Trading standards should be addressed. Planned obsolescence in any product should be heavily taxed, as it encourages a wasteful and polluting throw-away society. Durability and repairability must be emphasized. The social logic must be changed. People must be freed from materialistic consumerism as basis for social participation. Conspicuous inequality and conspicuous consumption must be reduced. This would reduce social costs, improve quality of life and reduce morbidity for all. Creating resilient communities is vital. To build social capital, several measures can be taken. Systematic and continuous efforts to establish and maintain incentives for local interaction, provide facilities for local training and life long learning, effective local crime fighting and law enforcement must be developed. It is also important to establish, improve and develop shared public spaces, libraries, parks and “green lungs”, comfortable and enjoyable public transportation, local markets, cafes, maintenance and repair, festivals and recreation centres and other initiatives for common purposes and social participation. Common renewable and carbon-low technology and infrastructure, climate adaptation and ecological enhancement, long-term investments, ethical, social and environmentally friendly production, reducing overall working hours and sharing of available work are tools for achieving economical as well as ecological stability. The Resilience Research Centre, Transition Towns Totnes, Wiser Earth and Economics of happiness are some of several initiatives in the right direction. The Country That’s Dismantling Its System of Privilege for the 1% — Can the U.S. Be Next? Why do we pay energy giants to wreck the Earth? UNEP (2012) Green economy? | What is green economy? Can transition towns help create a new economy? Chomsky, N. (2013) Can civilisation survive capitalism? Some say that the 99 percent should shut up and thank the fatcats for their crust of bread. But a few 1 percenters think that’s humbug. Is It Possible To Build An Economy Without Jobs? “Fiscal cliff” is scare talk and follows the “Shock doctrine” script. The looting 1% class wants more. EEA (2012) Unsustainable consumption – the mother of all environmental issues? The Business of a Better World: Can a New Kind of Corporation Save Us and Our Economy? It damages your credibility when you base claims on urban legends that you unwittingly regard as facts. The absurd notion that people believed the world is flat is an urban legend concocted and popularized during the 19th century. The ancient Greeks used geometry and shadows at different latitudes to accurately calculate the diameter of the globe. Nobody worried that Columbus would sail off the edge, rather the fear was that his journey to Asia would take so long that his crew would starve or die of thirst long before they completed their journey. It was dumb luck that he bumped into islands in the Caribbean, because had their been no north/South America he would probably have perished on his journey, never to be heard from again. Interesting that you believe in the myth that the “earth is flat theory” is a creation only from the 19th century. The Norse mythology stated that the earth was flat, placed in the crown of the Ygdrasil ash tree growing in the ravine of Ginnungagap. Columbus of course believed the earth was spheric. He was educated. But it is very likely that several of his crew members believed the earth was flat, and contemplated mutiny when they thought they were approaching the end of the world. Ordinary crews at that time would be analphabets. General schooling did not start in Europe until the 17th century. But this is taking the real discusson on a new economy off the track. Was that your real intention?